Stertil-Koni Mobile columns allow you to safely lift a wide range of Heavy Duty Vehicles. Thanks to synthetic wheels and hydraulic pallet truck mechanism they are very easy to move around. Lifting capacities range from 16,500 lbs. to 40,000 lbs. per column and they can lift any load 73 inches in just 94 seconds making them one of the fastest column lifts in the world. They are available in wireless, wired, or battery operated. 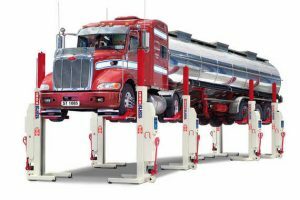 Featured on Stertil-Koni mobile columns is the new Ebright smart control system with a full-color touch screen.